Angular has been around for a few years now and since its release it has been useful when creating many different categories of applications, including web as well as mobile. The problem, at least for me, has always been that the experience for creating these various applications has been inconsistent and often confusing even though the driving technology has always been the same. Things have gotten better now that custom schematics can be used with the official Angular CLI. So what does that mean for us? We can take a project created with the Angular CLI, add a schematic, let&apos;s say for NativeScript, and end up with CLI compatible for both web and mobile. We&apos;re going to see how to use the Angular CLI to build a web and mobile compatible application with the NativeScript schematics. The above commands will install the Angular CLI, the NativeScript CLI, and the NativeScript schematics for the Angular CLI. You have to remember that the schematics are only for creating and maintaining projects. The NativeScript CLI is still required for building and deploying the mobile applications. Take note of the version of the Angular CLI being used. As of right now, 06/29/2018, beta.2 and rc.0 have some bugs that are scheduled to be fixed in rc.1. Until then, make sure you&apos;re using beta.0 instead. We won&apos;t get into it in this tutorial, but your computer must also be configured for Android and iOS development if you wish to build locally. If you wish to do a cloud build and skip all the Android and iOS setup, you can check out NativeScript Sidekick. Make sure you had navigated into your project before executing the command above. You have to be in a project that was created with the Angular CLI, so if you had created a NativeScript project with the NativeScript CLI, I don&apos;t think schematics can be included. However, if you&apos;re adding schematics to an existing project, the prior command should be used. More information on the schematics for NativeScript can be found in the official @nativescript/schematics repository. 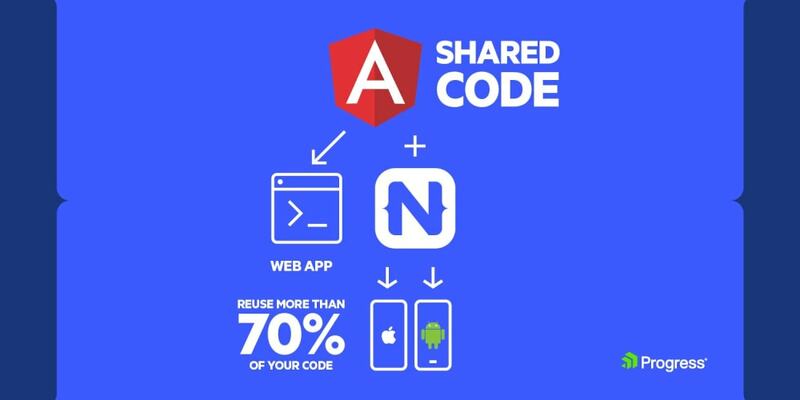 When you add the NativeScript schematics to your Angular project, you&apos;ll notice that it created quite a few files and even altered a few of the configuration files. Your original project should be in tact, so don&apos;t worry about something destructive happening. The most obvious thing that you&apos;ll notice is that you have some .tns.ts and some .tns.html files. At first glance you&apos;ll probably think that you now have to manage two different code-sets, which is not entirely true. NativeScript is a native mobile application framework which means you can&apos;t use standard HTML markup for the UI. For this reason, yes you do have to maintain a web UI and a NativeScript UI. When it comes to the TypeScript, you could have a web version and a NativeScript version for everything, but you don&apos;t need to. Where it makes sense is in the modules and routing areas since there are services like NativeScriptRoutingModule and RoutingModule which accomplish the same, but are specific to platform. If you haven&apos;t noticed, the differences are in the naming of the modules being used. Since this file is for the web, we have removed the tns from the filename and used the vanilla Angular modules. If you&apos;re coming from an established Angular project, you&apos;ll likely be playing catchup with the NativeScript version instead. In other words the reverse of what we&apos;re doing. We&apos;re only trying to match the behavior between the two applications. Since the application is fresh, the NativeScript version accomplished a lot more than the web version. The initial content further validated this. Where I&apos;m going with this is that you can use the Angular CLI like you would any other Angular application. You&apos;ll end up with a .tns.html file that you can add your custom UI for mobile to. There are plenty of other commands beyond generating components, so don&apos;t feel that you&apos;re limited. The above command will run the application on iOS. You can easily switch the ios part for android if that is better for you. The most important part of the command is the --bundle. If you don&apos;t bundle the application, it will crash with a lot of confusing errors. You just saw how to use the Angular CLI with a NativeScript Android and iOS application. This was a long awaited and insanely requested feature by both the Angular and NativeScript community. Having separation of CLIs for development that used Angular was doing no one any favors. It is important to remember that NativeScript projects build native mobile applications. For this reason you can recycle your logic, but separate UI components must exist. Even though it sounds like a bad thing, it is a good thing because you can give your mobile and web applications a separate, but very polished user experience. If you want to give NativeScript a quick try, check out the NativeScript Playground. You can build your first truly native mobile app deployed on your own device in 3 minutes.